Samsung's 2-5-inch 15.36TB SSD is now shipping, with half as much capacity again as the 10TB 3.5-inch disk drive capacity alternative, and taking up less physical space. This relative monster of an SSD first appeared at the Flash Memory Summit in August 2015. The PM1633a drive houses 512 x 256Gb 48-layer V-NAND chips stacked in 16 layers to create a 512GB package. Thirty two of these packages are then used inside the 15.36TB drive. So the individual chips are 3D in nature, and then the 512GB packages with their 16 layers are 3D too. Samsung's earlier PM1633 used 32-layer, 128Gbit V-NAND dice (dies?) and din't perform as well as the PM1633a. There is a metadata protection mechanism, plus a data protection and restoration software tool in case of a power failure. 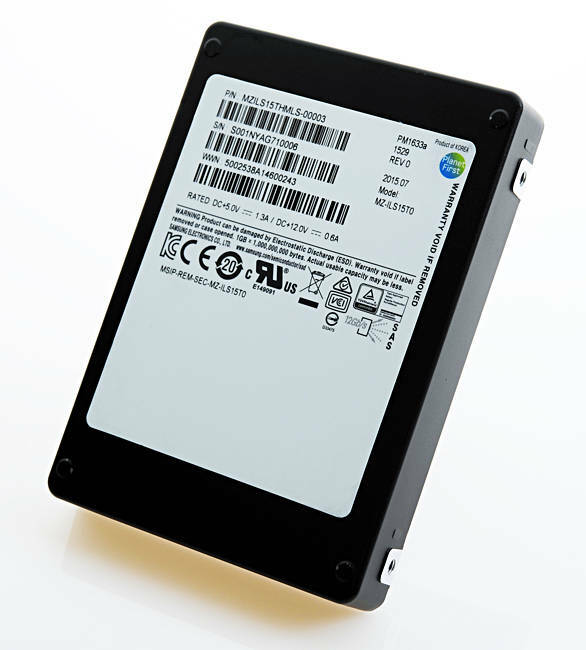 Later this year Samsung will ship 480GB, 960GB, 1.92TB, 3.84TB, and 7.68TB versions of the drive. It expects this drive "to rapidly become the overwhelming favourite over hard disks for enterprise storage systems," not differentiating between performance and capacity data storage in its statement. Samsung is ahead of competitors Intel/Micron and SanDisk/Toshiba in the SSD capacity stakes and has the high-capacity SSD market to itself over the next few months. Toshiba has a 4TB PX04SL, almost a quarter of the size of Sammy's new monster. SanDisk has a 4TB Optimus Max. Micron has a 1TB M550 and is sampling a 6TB 3D TLC NAND part, the B0KB. In general, Samsung could be a year or more ahead of its competitors at this 15.36TB capacity level. A flash array using 24 x PM1633 drives would have a capacity of 96TB vs 368TB using PM1633a drives. And that could be done in a 2U or 3U rack shelf space. To give HDD suppliers further palpitations we can fairly confidently say the next iteration of Samsung's 3D NAND technology, via layer-count increases and/or lithography shrinks, could produce a 30-31TB SSD or a cheaper 25.36TB one. What joy! This could be early writing on the wall.